White plaster walls and red roof tiles give this magnificent mansion, which covers about 10,000 square meters, its distinctive appearance. 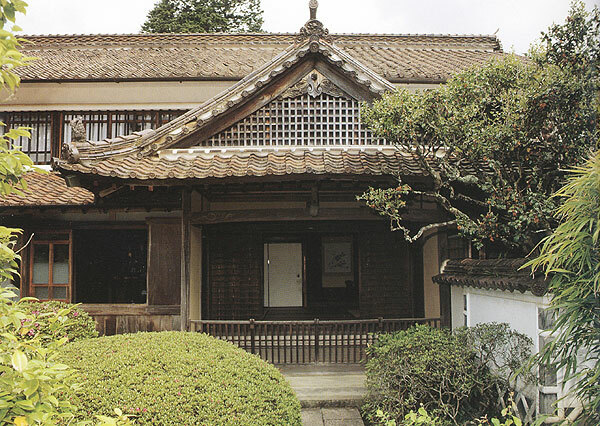 Said to date from the mid-Edo Period, it still today retains the ambience of that era. 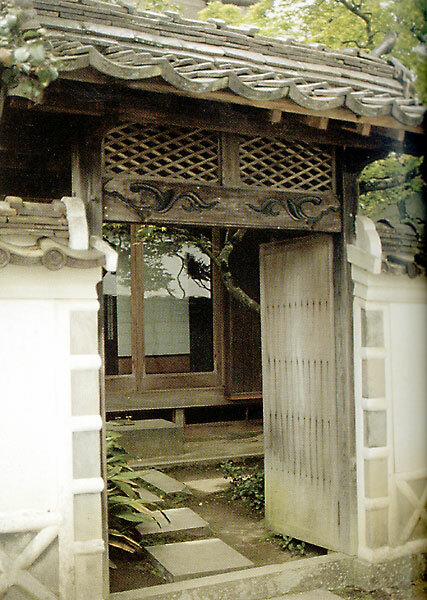 Even though the Nishie family were high-ranking village officials (ojoya), few residences in Japan can boast an entrance gate of such grandeur. 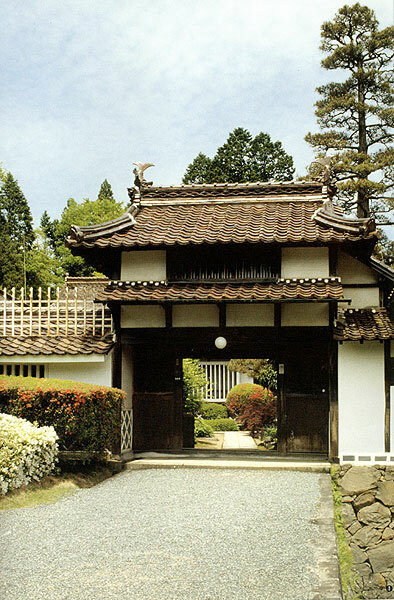 This tower gate comprises two stories, with a wood-floored room on the upper story. The main entrance was used exclusively for welcoming high-status visitors (lords), and was ordinarily kept closed. Its impressive roof resembles that of a Buddhist temple. Just past the gate is a courtyard spread with white gravel, which served as a tribunal for judging petty crimes such as brawling and gambling. The decorative onigawara roof tiles are patterned with swallowtail butterflies. 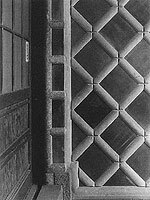 The walls on either side of the entrance to the earth-floored part of the house are beautifully tiled with distinctive plasterwork. 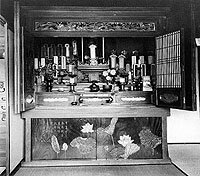 The handiwork of skilled craftsmen, this is one of the finest examples of namakokabe in Japan. 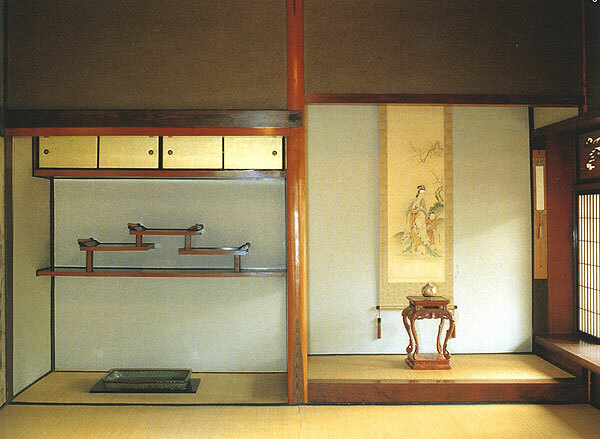 The display shelves in the alcove (tokonoma) of the reception room are arranged with an impeccable sense of harmony. Their beauty is further enhanced by the warm tones of the bengara finish. 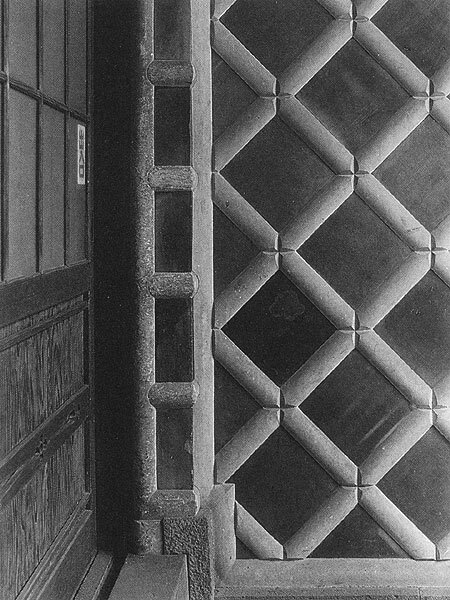 Many of the interior pillars were finished with their bark left in place, lending a rustic yet refined charm to the rooms. 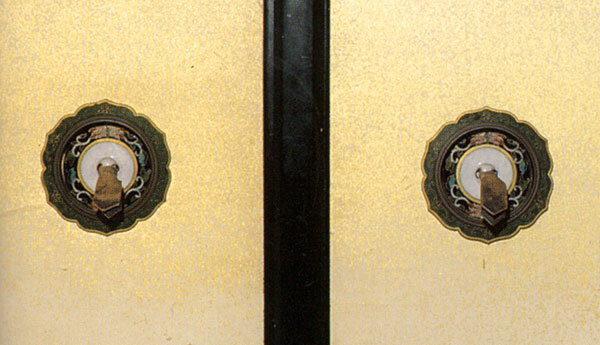 The handles on the fusuma (sliding doors) are highly ornate, featuring exquisite cloisonne work. 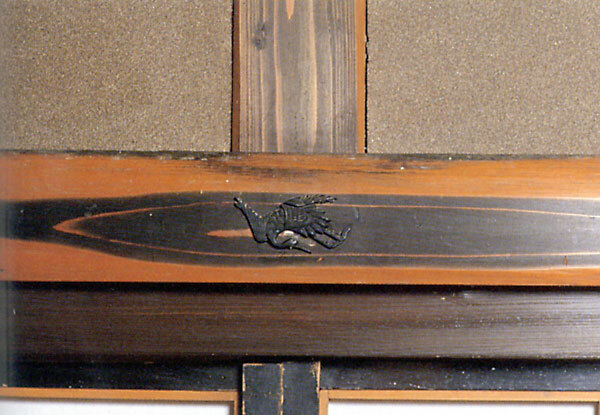 The fusuma frames are of black lacquer. 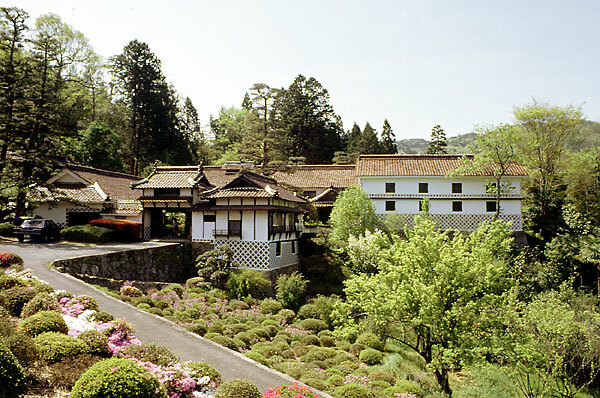 A view of the five rooms beyond the doma (earth-floored part of the house). 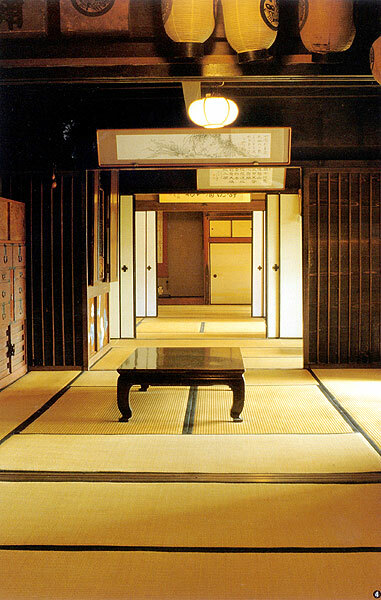 The interplay of tatami mats and fusuma doors creates a beautiful effect. This is a traditional floorplan seen in the residences of high-ranking village officials (ojoya). 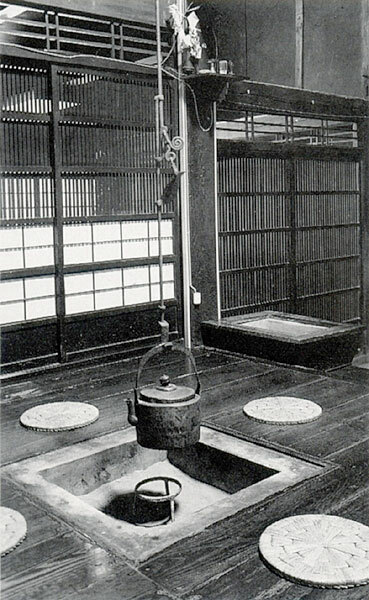 Area around the sunken hearth (irori). 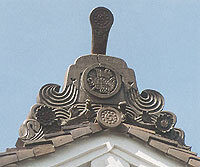 On the central pillar of the house is an altar to the kitchen god, known as Rokkuu-san. The Buddhist family altar is handcarved with great dignity from keyaki (zelkova) wood.